Save Room for Seconds! 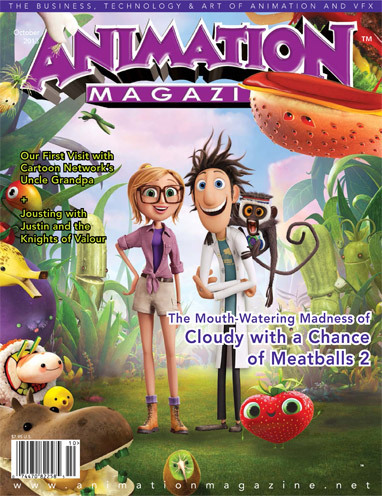 - Sony Pictures Animation delivers a delicious second helping with its 3-D CG sequel, Cloudy with a Chance of Meatballs 2. The Reign in Spain - Kandor Graphics' Justin and the Knights of Valour delivers a charming adventure set in an enchanted kingdom. Cartoon Network's Extra-Good Mornin' The manic minds behind the channel's new 2D toon Uncle Grandpa give us a glimpse into their super-positive world. Nine Shows to Track Down at MIP Junior The MIP Junior event in Cannes gives buyers and execs a look at the future of kids' entertainment. Here are nine new shows that landed on our toontastic radar. Rising Stars of Animation - 2013's crop of up-and-coming animators proves there's still room for originality and inventiveness in the toon landscape. Cloudy with a Chance of Meatballs 2, Justin and the Knights of Valour, Uncle Grandpa, MIP Junior and much more!